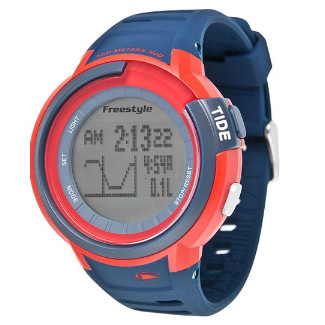 Introducing, the Mariner Tide, featuring ocean knowledge at your fingertips in the form of tide direction, time and height for 150 beaches worldwide in addition to sunrise/sunset times. Beyond just a surf focus, The Mariner Tide is a valuable asset to the boating, sailing, fishing, and diving communities who recreational livelihood often depends on tide, sunrise & sunset data. Featuring a 50mm case best for fitting large wrists, and a comfortable / durable silicone band, the Mariner tide is water resistant to 100 meters and backed by our limited lifetime warranty.